John H. Durham, United States Attorney for the District of Connecticut, announced that OLUKAYODE IBRAHIM LAWAL, 36, a citizen of Nigeria last residing in Smyrna, Georgia, pleaded guilty today before U.S. District Judge Jeffrey A. Meyer in New Haven to a conspiracy charge stemming from a scheme to obtain the personal identifying information of school employees in Connecticut and elsewhere. 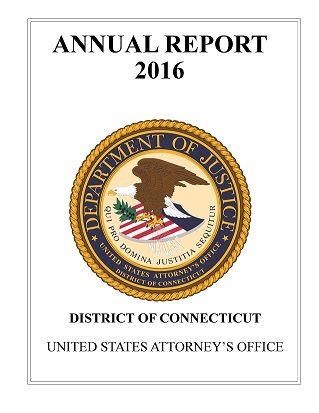 According to court documents and statements made in court, special agents from the FBI’s cybercrime squad in New Haven and the IRS have been investigating “phishing” emails that were sent to various school districts in Connecticut last year. In March 2017, an employee of the Groton Public Schools received an email that appeared to be sent by another Groton school system employee. The email contained a request to send W-2 tax information for all employees of the school system. The recipient of the email responded by sending copies of the W-2 information for approximately 1,300 Groton Public Schools employees. After the W-2 information was emailed, approximately 100 suspicious Forms 1040 were filed electronically with the IRS in the names of victims of the Groton phishing scheme. The 100 tax returns claimed refunds totaling $491,737. Approximately three of the returns were processed, and $23,543 in fraudulently-obtained funds were electronically deposited into various bank accounts. The other returns were not processed because they were suspected of being fraudulent. Lawal controlled or used certain email accounts involved in this phishing scheme. A co-conspirator of Lawal sent personal identifying information, including names and Social Security Numbers, of at least 10 employees to an email account that Lawal used. Lawal then sent the victims’ personal identifying information to another co-conspirator. The investigation further revealed that in February 2017, in a related scheme, Sacred Heart Academy in Hamden was victimized by a phishing e-mail that requested W-2 forms for its employees. Approximately 103 employee W-2 forms were compromised as a result of phishing e-mail. The IRS confirmed that 33 victims had fraudulent tax returns filed electronically with the IRS, claiming refunds in the amount of $314,184. The returns were not processed because they were suspected of being fraudulent. Lawal pleaded guilty to one count of conspiracy to commit wire fraud, an offense that carry a maximum term of imprisonment of 20 years. Judge Meyer scheduled sentencing for March 14, 2019. Lawal entered the U.S. on a visitor’s visa on November 24, 2016, and failed to depart on his scheduled departure date of December 1, 2016. He has been detained since his arrest on May 9, 2018. This matter is being investigated by the Federal Bureau of Investigation and the Internal Revenue Service, Criminal Investigation Division. The case is being prosecuted by Assistant U.S. Attorney Sarala V. Nagala. U.S. Attorney Durham thanked the FBI and IRS in Atlanta, and the U.S. Attorney’s Office for the Northern District of Georgia, for their valuable assistance in this matter.